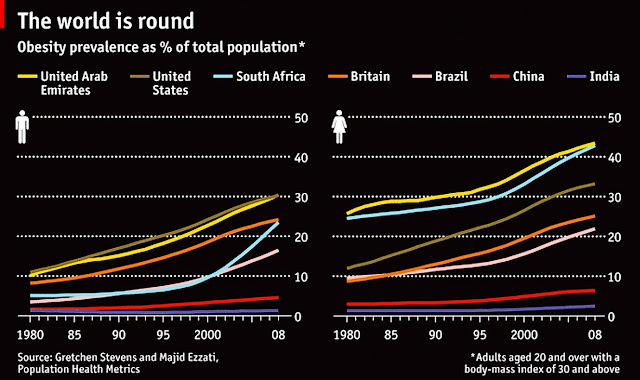 This graph about the average weight of people from different countries is from the Economist. How many people are overweight and fat in the world? The answer is quite fascinating actually, specially as gender wise stats are given. Obesity rates are rising across the world, but rising faster in developing countries. Indian and China still have relatively thinner people, lots of them, but this is set to change. More women from the UAE (United Arab Emirates) are fat as compared to their men. But significantly more American men are fatter than American women. I guess the need to look good is more prevalent amongst American women than the women from the UAE. There is similar trend in the U.K. British men are fatter on an average than British women. Indian women on the other hand are becoming a little fatter than the men! In China there doesn't seem to be a significant difference between the sexes. Less Brazilian women are overweight as compared to their men, but the difference is not as marked as the average weight difference between American and British men and women. Although South Africans are not as overweight as the British and the Americans, there appears to be a sudden increase in their weight after the year 2000! The women are fatter than the men in South Africa. Now, that's the weight the world is going to bear and one can only imagine the future!